See the smooth transition from pink to white…. Oh that is sooo nice. I can’t emphasize enough that the fabric be pre-washed. Even if it ‘claims’ to be ready to dye. During that pre-wash detergent that is used must be thoroughly rinsed out. UNDER NO CIRCUMSTANCES use fabric softener in the pre-wash.
I’ll admit, I’m a little kid inside. I love to watch the dye swirl around. Follow or Discard the directions on your dye. While this may seem counter-intuitive what I mean is ask yourself a question. Do I want the color of my fabric to come out even and exactly like the dye packet? If yes, then follow the dye manufacturers guidelines. If you are going to mix colors and experiment then go for it! I added a ton of extra water and a little orange to get a pastel-peachy dye. Totally not kosher according to the package. Important: prepare the dye for the darkest color you want to achieve. Step 2: How the Hell Do I Know How Dark It is? The more dye you mix the better you are at gauging how much you need. I thoroughly ‘fubar’ed my first bath up because Dylon dye is waaaay darker than Rit. Wasted a ton of dye which makes me angry. It isn’t exactly cheap. Here is one of the MOST important steps in dyeing. Test Strips. I don’t care if you are peeling a string out of a hem. Get a thread to test with at least. Because the chances the color is going to be right on first dye dip are slim. You’ll need to adjust color or time in the bath. And maybe even more important RINSE AND DRY THE TEST FABRIC. I rinse under cold water and iron mine because I am impatient. See how the middle sample is so much darker? That is still wet, while the one on the right is partially dried by the iron. Note: the old towel is used because a little dye comes off while ironing. 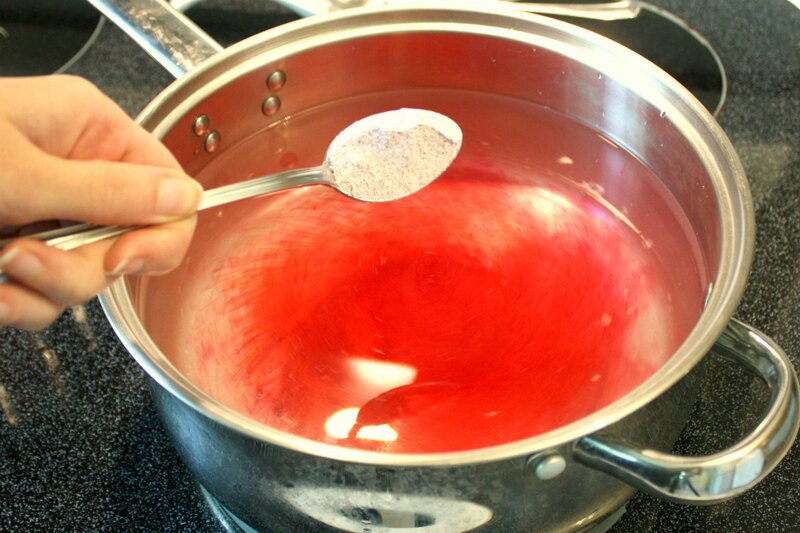 Once you have gotten the dye to your liking take some of it and add it to a bowl and dilute it in half. 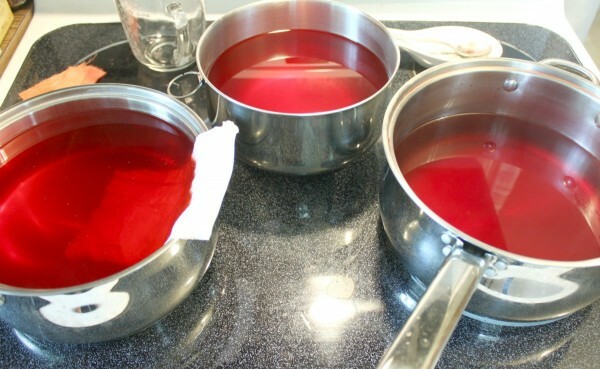 Basically add the same amount of water as you did prepared dye. 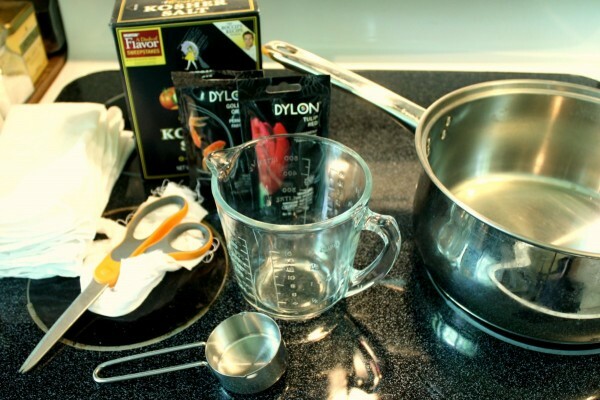 Then take the diluted solution and add it to a third bowl and dilute it in half again. I like to test my dye and make sure the three colors are different enough to be noticeable. Sometimes this requires adding a little dye or water to make three distinct colors. Once you have them to your liking take your fabric and dip it in the lightest color as high as you want your ombre to go. Finally set a timer and move it around a little (up and down) every few minutes. This will make the dye line more subtle. My first dip was 15 min and I moved it around a little every 5. 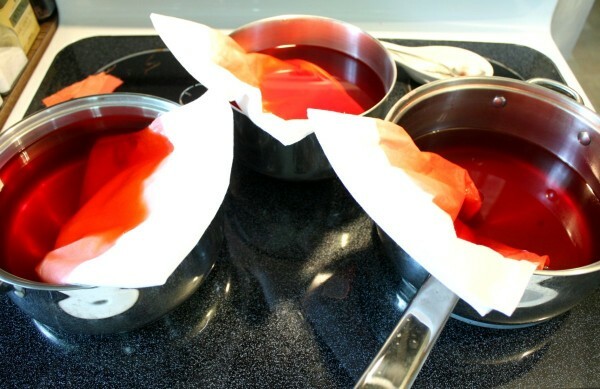 I don’t pre-wet my fabric as I like the dye to wick up the fabric slightly during an ombre process. Here is the boring part. You have to do the same process as step three for all three solutions. Next you dip in the medium strength solution about halfway up the dye part. Wiggling it in and out of the dye line to make the edge more gradual. Finally, you hit the tips with the darkest. As you can see I did multiples at a time; moving one from one bath to the next in rotation. It is really tempting to put a bunch of fabric in each pot to speed up the process… Resist. I repeat: Resist. When you are done rinse them well under cold water BEFORE washing. Extra dye will stain the white or light portion of the fabric no matter what. Rinsing keeps this to a minimum. Finally wash and dry your items as suggested by the dye manufacturer and fabric type. 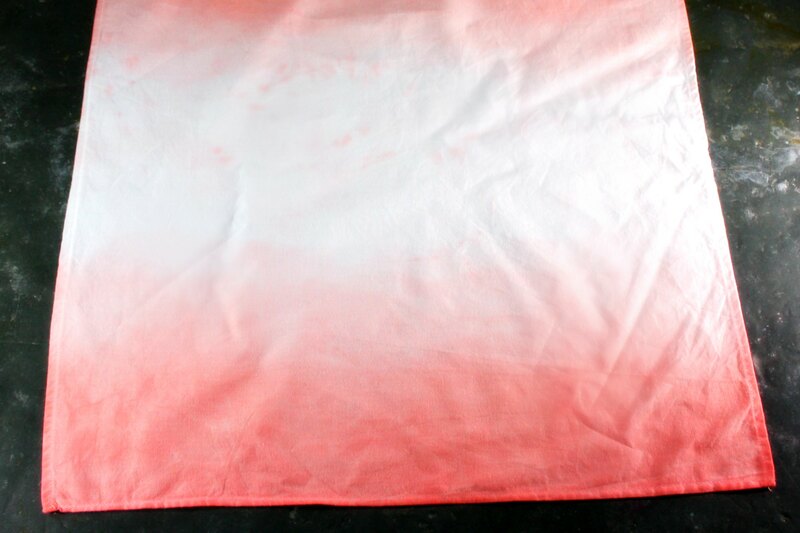 I folded the fabric in half and did both ends at once to get this ombre look on both sides of the napkin. Also didn’t iron it… In case you were admiring the wrinkles. As usual gloves are useful for not dyeing your hands… And as usual I did not have any and ended the day with nice pink fingers. While these napkins look pretty good, I took them one step further by adding gold foil (a kind of fabric friendly gold leaf) to the edges. 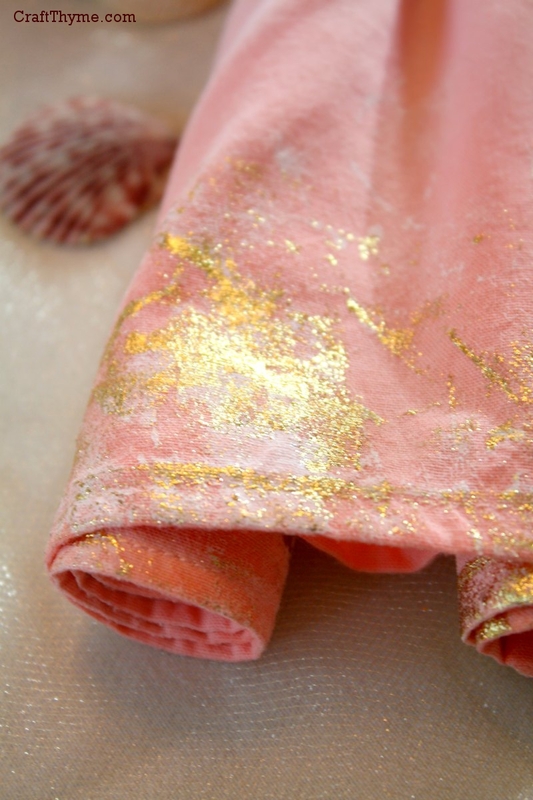 Tutorial for gold foiling fabric will be up 8/8. Here is a preview. The problem is that most organza is made of synthetic fibers. Unless it is a silk organza you would have to test carefully and perhaps use specialized dye. I’ve been wanting to dye one of my gauze swaddle blankets and used your tutorial to do it. I figured, even if it didn’t work perfectly it would still look pretty, and I was right but I did have some issues. It was a lot of fabric to put in my bowls all at once and I think my results would have been more even if I had larger containers to dye in so the fabric could move freely. I also walked away for a few minutes once with the fabric partially in the second bowl and when I came back, my dye had wicked up the fabric and was spilling off my surface and on to the floor in a puddle. Ack! Because of this, the top of the fabric is slightly dyed instead of white. Do you have problems with this when you are doing the second and third bowls? Do you somehow suspend the fabric above the bowl? I can’t think of an easy way to do this inside. I have not had that happen to that degree. I have always wanted it to wick a bit so the lines aren’t so choppy. My guess is that the gauze fabric is so absorbent that it just sucked the dye right out of the pot. If you have a lot of fabric you can always roll it around a wooden dowel or spoon that is wider than the pot. Just unroll what you need and the dowel will hold it across the top of the bowel or pot. You might try wetting the gauze first before putting it in the dye. That would saturate the fibers so it wouldn’t wick as much moisture. 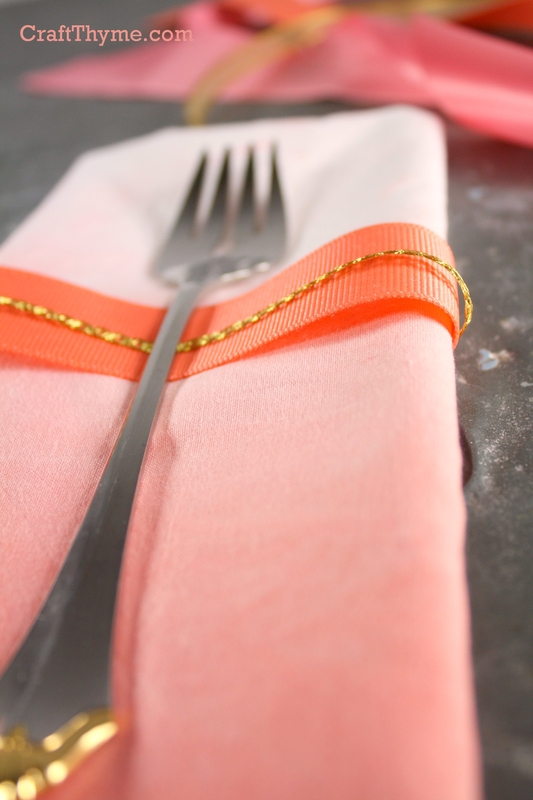 I love the color of these napkins and they are DIY! I love it! Dropping in from Pretty Pintastic link Party! Thanks for the inspiration! I’m still a huge fan of ombre too! Thanks for dropping by! Thanks for the tutorial, I am going to dye some fabric for a cross stitching project. The fabrics online can be pricey so this is a good alternative. I find it is a great way to find the perfect color. Dyeing fabric makes it a perefect match without spending a ton of money. Excellent and well explained, thanks!